So what we have is a page that shows a list of "Vehicles" and the Passengers inside them. Imagine that each "Header" is a Vehicle and when you click the accordion button, it will expand to show the Passenger details. Now imagine the list of Vehicles can go up to 50+. If I use accordion, the load for this page would be very information-heavy. So my question is, for this type of page, should I use a pop-up overlay instead? What other methods can I use so that I don't need to go to a separate page to show the Passenger info? Edit: This scenario is different from the existing question because this is about overall page cognitive load and not just about scrolling. Can you provide us some more context? Is this a mobile application? Or a website?You're using an accordion to display a minimal amount of information (vehicle) and all details are indeed crammed into 1 place. Perhaps it could be helpful to change your visual representation of the 50 items. Is there perhaps an overlaying class that can bundle these vehicles first (based on type of vehicle, based on amount of people inside them, based on location or route,...)? You might use filters to delve into those 50 items. 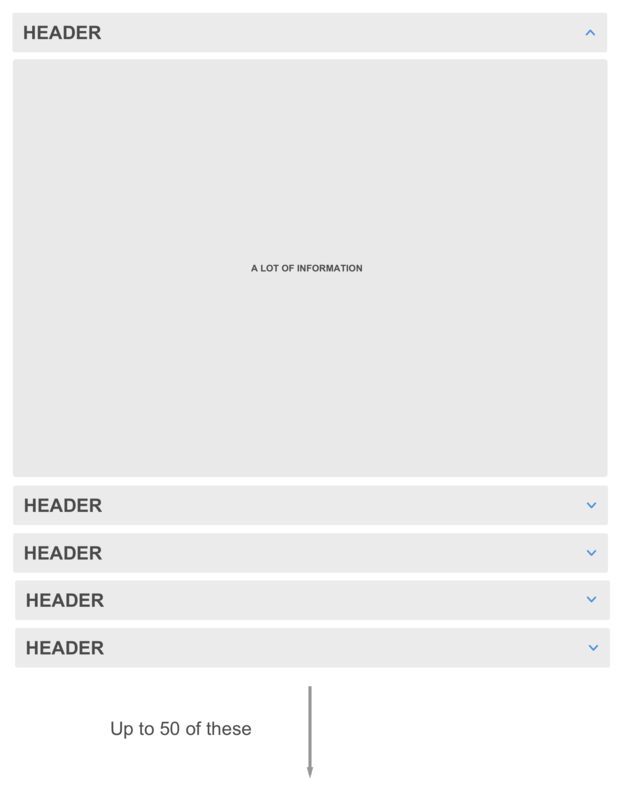 Then you can show perhaps a list that is less than 50 items, lowering the cognitive load of the entire page already. I think vehicle title alone might not differentiate the items enough. Perhaps you can show how full / empty a vehicle is. On whether to use a modal or accordion, we need some more information on what the details are specifically and all its use cases. If you are afraid that you're creating 'a seperate page' just for the passenger info, perhaps you should think of a way to quickly switch vehicles when you're on a detail page. Not the answer you're looking for? Browse other questions tagged information-architecture popup accordion cognitive-load overlay or ask your own question. How to handle very long accordions? Accordions or anchor links for grouped content?